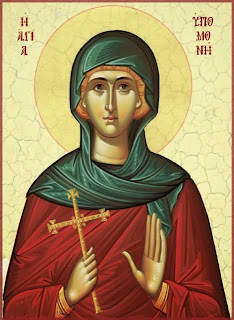 Saint Ypomoni (Augusta Helen) truly loved the people and stood by them in their anxieties and concerns before the fearful danger to the nation, and she strengthened them by her prayers and comforting words. She faced joys and sorrows with hope in God which is why she was balanced in all things. The philosopher George Gemistos-Plethon writes among other things the following about her: "This Queen with much humility and perseverance appeared to address the two ways of life. Neither at the time of testing was she swayed, nor when she was granted rest, but in each case she did what was required. She joined together intelligence and bravery, more than any other woman. She was distinguished for her chastity. She had completely deep righteousness. She did not know how to do evil to anyone, either men or women. Instead we know that she did much good to many. With what other way can righteousness be shown in practice, other than to never do your own will or show evil towards anyone, but only show good to many?" Also, Gennadios Scholarios, the first Ecumenical Patriarch after the fall, in his comforting words to Emperor Constantine XII “On the Dormition of his Mother Saint Ypomoni”, writes: "This blessed Queen when she was visited by someone wise, he would leave amazed from her unique wisdom. When she met some ascetic, he would leave after the meeting, shamed by his poor virtue and ashamed by her virtue. When she met someone intelligent, he would be struck by her greater intelligence. When she would meet with a legislator, they became more careful. When she spoke with some lawyer, they believed that they had before them the Rule of Law in practice. When someone brave would meet her, they would feel defeated feeling amazed by her patience, wisdom and strength of character. When she was approached by some philanthropist, they were struck by her greater and perceivable feeling of philanthropy. When she met some friend of amusements, they would gain wisdom, and coming to know their humility before her, repented. When she met some zealot of piety, they would gain greater zeal. Everyone suffering, after meeting with her, received some relief of their pain. Every arrogant person berated his great self-love. And in general there was no one who came into contact with her and did not become better." After the repose of her husband (1425) - who two months earlier became a monk - she was tonsured a nun in the Monastery of Lady Martha, and took the name Ypomoni. And as her contemporary George Frantzes writes: "She joined with the meaning of her monastic name (Ypomoni=Patience) with the way she confronted the good and also the many difficulties in her whole life. Patience in life, deed and monastic name." It pleased God that she not experience the pain of the fall of the empire, which is why He invited her near Him on March 13, 1450. Patience is a gift of God, which is given to those who are struggling and who pray to acquire it, that they may be able to withstand their daily problems, their difficulties and the temptations of this present life. Patience is absolutely essential, because without patience a person cannot accomplish any major project, especially the most important of all, their salvation. And by the term "salvation" we do not mean the inheritance of the Kingdom of God after death. Of course, it is this, but it especially means the knowledge of God, which is gained by living the way of life as taught by the Church. Otherwise, it is impossible to endure the way of life in the eternal Kingdom of God, unless they live it in their present life, because it will appear to be hell for them. Besides, this is in fact hell, namely for a person to not be able to withstand the love of God and instead of experiencing this love as light and joy "through their inner purity", they experience it as fire and pain "through their inner impurity". Patience is closely linked with hope in God and confidence in His love. If someone does not believe in eternal life and the "respite of future goods" then why endure, and who will give them the strength to endure? Patience is drawn from God, and at the same time leads to the knowledge of God and communion with Him. Not to the knowledge about God, which is acquired by the brain and reading, but the empirical knowledge of God, which is personal communion with Him. And this knowledge, according to the venerable Mark the Ascetic is acquired through patience during unfortunate events in life and the assumption of personal responsibility - by each of us - for our mistakes and sins. He writes: "True knowledge is patience in misfortunes and to not ascribe to others your affliction." In other words, through patience during the sad events of life one gains the knowledge of God, and those who know God and have communion with Him receive great strength, so they can endure without complaint, thanking and glorifying God. And they also consider themselves the cause of their failures and sufferings and not others, because other people are not our hell, as the atheist existentialist Sartre says, but our paradise, according to the patristic words: "When you see your brother, you have seen God." Patience requires humility and self-reproach, spiritual prowess and bravery, hope in God and absolute trust in His providence and love. By these all daily problems and difficulties in life are exceeded and we maintain inner peace. Source: Ekklesiastiki Paremvasi, "Ἁγία Ὑπομονή", February 2014. Translated by John Sanidopoulos.